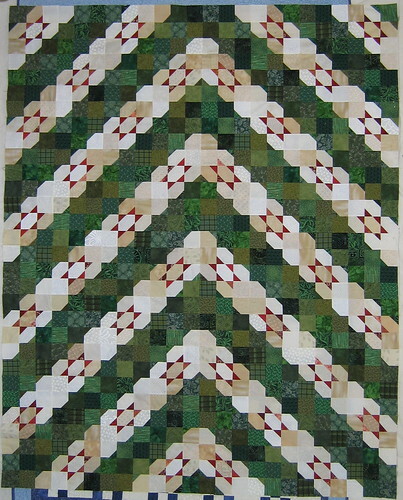 Here is that quilt top all done! This is what I will be doing with all the little leftover HSTs from this quilt and it's big sister. It is called Lady of the Lake and since I have 1200 HSTs and each blocks uses 20 of those, I will end up with 60 5.75" blocks for a little quilt. I did this block in a hurry and not well so I will have to take it apart some but I wanted a sample to put away with the HSTs until I get to that project. This morning I plan to get all my fabric from last week prewashed and put away or set aside for some projects I need to get finished with soon. Wow, to have the time and energy to have 1200 HSTs left over!! I am so impressed with your productivity! And excited to see the Lady of the Lake quilt come together. 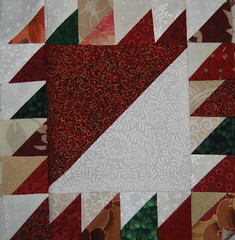 I linked up your first block as a sneak peek to your upcoming quilt on the Lady of the Lake block page on Quiltivate.com. Thanks for inspiring your fellow quilters with your work! Thanks Kacie! You will have to wait a little while to see the finished product. I am saving it to be one of my projects for my next quilt retreat in October. I have other things more pressing to finish coming up soon.